You know, this is a salutation that we will be hearing and uttering thousands of times in the next sixty hours. At 12:00 on Tuesday night, the ball will descend on Times Square. In Central Park, there will be an eruption of fireworks. And this will all touch off some times of wild celebration of the New Year 1986. It’s a good thing to take a look at what this means. What is a year? We know about the earth’s rotation around the sun. Yet in an age of space consciousness, it’s not too much to imagine being out in space, far from the solar system, with no sun to rotate around, no sunset or no sunrise. Now what is a year? Obviously, it is more psychological than astronomical. A year, we could say, is a convenient means of keeping track of footprints in the sands of time. But lo and behold, the winds of change soon blow them away, leaving only the allness of eternity. So what is a year? It’s an excellent opportunity to get a new insight into this thing called time. Time is not a passing phenomenon, but rather it is an unfoldment of an infinite possibility. Every day we unfold many of the infinite possibilities of life. Only a few of them do we actually see, and a smaller percentage of them are actually realized. But a possibility can never be less than a possibility. So in tomorrow and tomorrow and tomorrow, it continues to unfold. This means that a new day is really a fresh opportunity to move in the field of possibilities which are constant. A year is a convenient device for keeping track of things historically and economically. It’s a good slide rule for fiscal accounting so that we can pay our income taxes properly. It may encompass a season for a sports team, a unit of work for a student. It can be an amazing, helpful device in self-evaluation. But has little relevance as a measurement of life. Sometimes we say, “This is my 10th year on this job.” Or “This is the year of my 50th birthday.” Or “This is the year 1986.” But what does all that mean? It’s like labeling the waves of the ocean. Here comes wave number 6527934596321. Kind of silly, isn’t it? Because a wave is a wave. And no matter have gone before, how many will come after. And then what is a wave? Simply the ocean forming itself, for a brief instant, into a wave. So a year is not a thing. Certainly, 1986 will make no automatic collection toll on life. We so often say, “Life takes its toll,” but that isn’t really true. You’ll really be no older in 1986 than you were in 1985. You may be a little wiser, hopefully. A little happier. People often refer to a good year or a bad year. “Oh, I just hope I have a good year.” As if the year came in a beribboned package that we draw blindly out of a hat, hoping it would be lucky and get a good year. We say, “I wonder what this year will bring me?” As if it’s all wrapped up and predestined. Then we become vulnerable to the many psychics and seers who, for a fee, will let you peek through the curtain of Providence, or so they say. Whatever that means. I’m going to suggest to you today that you change your perspective just a little bit from the normal. That you think not just to the year, with its beginning and its end, but the days and the months all rocked into a timeframe. But think in terms of an era, in its timeless sense. A new phase of living. A new level of consciousness. It may be a fortnight. May be a year. May be a whole life before you. So as the year winds down and people excitedly cry, “Happy New Year,” you can add a dimension of consciousness by declaring, “Happy New Era.” They probably won’t tell the difference, but you will. You’ll be thinking in terms not of just this locked-in year ahead of you, but a whole new phase of life. You commit yourself to a new era of spiritual growth. Also, I’m going to suggest that you make a contract for yourself. Committing yourself to the kind of attitudes that will be most likely to lead to a new era in your spiritual improvement. At the close of the hour, as we promised, we’re going to give you a contract, all formulated, simply for you to sign. Or you may prefer to create your own. But any rate, you can use it as a basis for prayer and meditation. Let’s consider some of the things that might go into our contract for 1986. There’s so many. Here are just a few. First of all, keep out of the past. You need to be alert to the common human tendency to look backward in feelings of nostalgia, longing for a return to the peace and joy of other years, and that terrible assumption that past solutions are the only answers to the problems of today. And feelings of grief and regret, guilt and anger and resistance to change. Sometimes, as many of us know, there’s a tendency to change something that happened in the past. Something that we disliked, something we’ve been hurt by. We want to change it. We want to alter it. “Oh, if I could only have it all to do over,” we say. Unconsciously, we try to un-happen things. This may well be the major cause of unhappiness. The attempt to un-happen experiences. On the other side of that coin, avoid trying to live in the future. Make a covenant with yourself that you will keep out of the “someday” consciousness. “Maybe this year will be the year my ship comes in,” they say. I call it life on the deferment plan. So often, people say, “When Saturday comes, I’ll be able to relax. Get out from under and enjoy life. When Saturday comes, after I get through this miserable work week.” The national slogan for some persons is TGIF. Thank Goodness It’s Friday. These people live only two days a week. The other days, they’re just looking forward to living. When? When Saturday comes. When the weekend comes. When my vacation comes. But there can be no when in the New Era. Only the eternal now. Cervantes says, “By the streets of by-and-by, one arrives at the house of never.” Many of us frequent that street, and deal with all sorts of never never lands of tomorrow, later, someday, when I have more time, we’ll see, maybe we’ll work out, maybe a job that needs to be done. But the by-and-by consciousness gives rise to procrastination, which may be the fear to attempt due to an expectation of failure. So the best way to shield yourself from that possibility is to come up with apparently logical reasons for not launching out. We have a lot of them. Tiredness or sleep are marvelous reasons. Do you ever notice how tired you get when you’re close to actually doing something difficult? Illness works pretty well, too. How can you possibly do it when you feel so bad? When everything else fails, there’s always the, “You see, I really don’t have the time,” excuse. Course, we know we always find the time to do the things we really want to do. And the final pronouncement, “It’s really impossible, you know.” And who can argue with that? In the New Era, we need to listen to Goethe as he sings, “Whatever you can do or dream you can, begin it. Boldness has genius, power, and magic in it.” You may express great confidence in the belief that someday, you’re going to be healed. You may even say, “When I get over the sickness. When I’m healed from this illness,” implying that then you’ll begin to live. If someone were to ask you right now if you would like to be healed right now, you would probably reply, “Yes, but ...” And in that little word but, we can see your belief in restriction. What you want for yourself, you must accept now, or possibly never have it. There’s no future in the eternal now of infinite mind. The only demonstration there is or ever was is in the divine kingdom within you. And that is in the eternal now, always present. One of the weaknesses of the typical prayer or treatment is that is it directly or subtly dealing with futurity. If you think that a problem is something to be solved in time, then you’ll probably be praying that God will heal you, or that a demonstration of supply will be made. So unconsciously, you’re relegated to the streets of by-and-by. People often ask why their prayer is not answered. This is most often the reason. The beautiful realization of truth that we use so often is, “Wherever I am, God is.” Wherever I am, God is. In the New Era before you, wherever you may be, in time or space, God is with you and within you. You cannot get outside of the presence. Even more important is the realization, “Wherever I am, I am.” Wherever I am, I am. In other words, wherever I happen to be, the whole of me is present. The all of me. In January or June, or April or December, I am. It’s the one sure thing about the year for you. I am. If you would be in the creative flow in facing any situation that comes to you, start what you do with, “I am.” You may want to hold this realization that I find very helpful. “I can do what I want to do and be what I want to be if I know that I am.” It simply says that the source, the substance, the fountain, is always within, and is ever-present. I am. In the New Era that you’re entering, it is important to avoid what we might call the comparison game. We do this so often. Smarter than, not as smart as. Prettier than, not as pretty as. But you see, you are you. Use your own standards. You’re intelligent because you can do the thing you want to do. You know you’re attractive because you’re being and expressing who you are. Why accept someone else’s standard of attractiveness as yours? So absurd to run your life on the basis of comparison with others. You are incomparably unique and wonderful and growing. Of course, keep reaching for the heights. Not so that you may be better than someone else, but so that you will be better than your former self. Reach for the highest, but be grateful for how far you’ve come. Be patient with yourself. This is so important. Give yourself the privilege of occasionally missing the mark without self-condemnation. So many truth students have this perfectionist attitude. They’re constantly lashing themselves for falling down. Falling down is not the important thing. Getting up is the thing that counts. Keep yourself centered in the creative flow. There will be no pressure or anxiety if you’re at peace. When you’re centered within, you’ll be able to keep up a busy schedule, carry heavy loads, and produce great amounts of work without strain or pressure. You will walk easily throughout things, because you are in charge. You’re in charge, not the clock or the calendar or the economy, or world conditions or fear of the future, or worry over the past. Out there in the world, there may be a variety of things that might normally give rise to pressure. But you can cope, because you’re in tune. Few years ago, in the city of Detroit, there was a newspaper story of a man who went blind on his way to work. He was riding the bus. Suddenly, the lights went out. Lost his eyesight completely. Now, he could have cursed his fate. He could have stopped everything right there, and no one would have blamed him one bit. But the thing that made this story so special, the only reason it really got in the paper, made news, is that he continued right on to work. Took his place at his stenotype machine, did his normal work as a court reporter. You see, he’d been informed six months before that this would happen. And he made a contract with life that he would continue on with his productive experience, expecting and accepting life to continue to flow through him. I know what you’re thinking. You’re wondering, “If life is whole, and if prayer works, why couldn’t he be healed?” But you see, he could only deal with his experience at the level of his consciousness, not yours. Not something in a book. His demonstration came at the point of awareness where he was. And he chose to grow through the experience instead of being destroyed by it. And that’s a great demonstration. This recalls Walt Whitman’s great contract, when he says, “Oh, while I live, to be the ruler of life, to meet life as a powerful conqueror, and nothing exterior shall ever take command of me.” Tremendous commitment. My mother had a favorite expression. “If a thing is worth doing, it’s worth doing well.” And she was talking about the pursuit of excellence, which is so important. But I paraphrase this by saying, “If a day is worth living, it’s worth living in a high state of consciousness.” If a day is worth living, it’s worth living in a high state of consciousness. Let this be a part of your contract with life. Of course, there’s a need for discipline, to keep the high watch. There’s a widespread belief that discipline means repression or suppression. But you don’t become a student of truth by suppressing contradictory thoughts. And superimposing upon these thoughts that you have new insights of truth. Some teachers get involved in the idea of programming the mind, but this always leaves a little bit to be desired, because in programming the mind with positives, you’re not letting go of the negatives. You’re simply burying them. They’re still a part of your consciousness, I believe. The love of truth is the important thing. Not resistance to error. Commitment to the idea of the greater possibilities of your nature. And toward positive responses through all of life situations. This reminds me of a student who came to Manly P. Hall one time and asked him, “Should a sinner teach?” He said, “of course a sinner should teach, but he shouldn’t teach his sins.” The world would be strangely without leadership if everybody had to wait til they were perfect before they got up in front to teach another person. There’s a woman who said sh wanted to live each lesson and master before she moved on. Admirable as it was, I suspect that in back of her lovely rationalization is a tinge of procrastination. So often, we start out with such high hopes. But so many things interfere. They finally lapse into the file called, “Unfinished business.” It’s the fattest file in all of our cupboards. Books we start to read and then, interrupted, we never returned to. Projects we start and leave unfinished. Let me ask an embarrassing question. How many unfinished projects could you find on your desk, in your closets, at home? In your garage, in your attics, in storehouses? Why do we stop before completion? Why this constant pattern of unfinished business? Basically, it’s simply that we forget the Kingdom of God is within. We forget that we have an ever-present resource within by which to do and do well whatever needs to be done. We lose track of that. That slogan that’s on the National Library in Washington, D.C. on the wall, “For a web begun, God sends the thread.” For a web begun, God sends the thread. The spider unreels all that he needs to make his web and comes almost ceaselessly. If we could only know that. We start things that we’re not centered. So we scatter our forces. In our complex society, there are hundreds of attractions vying for our attention and involvement. Ads appeal to us to enroll in this course, to get into that program of body building and weight control. Read this book. Learn to write. Learn to paint. Learn to knit or sew. So the average person tends to become a house divided. He wants to grow, he wants to improve himself. So he’s interested in all these things. But doesn’t focus on any one of them. He gets involved, he’s like the man who gets on his horse and rides off in all directions. So as a symbolic gesture of your contract, select one of those many unfinished projects and complete it within the next few days. Complete it, and you’ll give your subconscious mind a message. May be a blessing to you. Finally, I’m going to make a suggestion that we rarely touch on, but is so important, I think. That you make a contract with life in which you will live in what we could call creative altruism. One can never be fully alive if he’s engaged in resentment or bitterness or downright hatred. It’s a terrible burden to dislike people, even to be critical. All it does is to cover up a perpetual pain in the heart. So much easier to love people, to be patient with them. Even to forgive their errant ways. Remember, by focus of your consciousness, you become either a part of the solution of the world’s problems, or you’re a part of the problems themselves. Say that again. By focus of your consciousness, you become either a part of the solution of the world’s problems, or you’re a part of the problem. So if you discover some kind of resistance within you, some feeling of enmity, some prejudice, even some petty annoyance, it’s time to go within. To realize that this is an opportunity to learn love. Thus to awaken to a new level of life. In describing the work of Jesus, Paul says that He went about doing good. He went about ... this is an innocuous statement. He went about doing good. But it’s a very violent one, implied. You might want to make this a part of your contract with life. We normally put so much emphasis on making demonstrations of prosperity. Personal fulfillment in various ways. It might be good to make a commitment to a New Era of just doing good. Sounds strange, isn’t it? Sounds rather empty. Actually, it could be said that all sound policy in business, and all sound practice in social life, are based on this dedication to doing good. Certainly, I don’t gain much experience in life if I do not realize that most of the things I do must be done for others. Even when my primary purpose is to accomplish something for myself. For instance, to earn a wage, I must do good for my employer. To work effectively for my employer, I must see my opportunities to serve him. To be successful in a business of my own, I must see opportunities to serve my customers. And to attract more customers, I must learn and remember the ways of the public, its likes and dislikes, its habits. I must become observant. I must become thoughtful. I must think in terms of doing good. Newspaper people often speak of a reporter’s developing a nose for news. We need to develop a nose for opportunities to be helpful and inspiring and constructive in our life with others. And I think it is the helpful, inspiring, and constructive people who are going to heal the hurts of this self-wounded old world. And it is to them that the world will bring, ultimately, a grateful reward. You may say, “But I want to do good, to radiate love, to enter a New Era of creative altruism, but I just don’t see the opportunities.” As Jesus says, “You have eyes, but you see not.” Here’s a very simple, homely illustration. Without looking at your watch right now, I ask you, is the figure six on the dial a Roman or Arabic numeral? The face of your watch is one of the most familiar objects in your environment. You may look at it many times a day. All right, look at your watch now. Is the figure six Roman or Arabic numeral? You may be surprised. A few of you may have been correct, but for most of us, we discover that our watch doesn’t have any figure six at all. Some watches, the second dial is right where the six should be. If there’s no second hand, your watch might simply have a series of marks without numbers. Even if there’s a six, it might be Arabic or Roman, so the likelihood of your being correct was statistically very slim. How many of you were correct? Very observant, that’s good. It’s a very small percentage, though. This is a simple, homely illustration, but simply to indicate how limited are our powers of observation. We see things, but we don’t see them. So we see lives of people around us, to which we could do great good, but we don’t see it. We’re not involved in it. We’re too self-centered. We’re not giving enough of conscious awareness to letting this something we call spirit express. So what I’m saying is, make a contract with life to look for ways in which you can give yourself away. Someone once said that “God watches over kind people.” We don’t mean that in a sense that God is up there in the sky and He looks down on people, we’re saying that in a sense that when you’re in tune with the creative flow, you’re consciously involved in a process that is continuously supporting and enriching. We’re not talking about the pretentious or the ostentatiously kind people that parade their kindness, but the really kind, the genuinely kind, the secretly kind. Where kindness is love in action, and God is love. So look for opportunities to do good. Again, this is not something we think about so often. We’re so involved in the materialistic aspect of demonstrating things. But make it a habit to do good, to develop it as a power. It will enrich your life more than anything else that you will ever do. It will keep you young. It will fill your days with happiness. It’ll fill your nights with peace. It will endow your life with tremendous meaning. 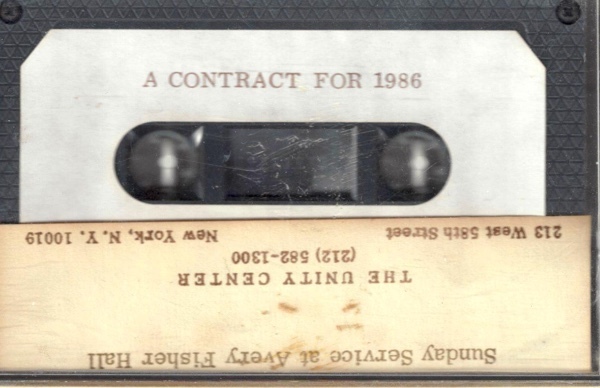 We’ve touched upon a number of things that might inspire you to write your own contract for 1986. As we said, Olga and I have prepared a symbolic contract which we will present to you as you depart today. We’ve especially blessed this contract. If you create one of your own, and we hope you’ll do so, this may simply be an additional prayer of commitment. You may want to put it in a place where you’ll see it often, to continue to renew your contract. Let me say, these are very personal, and just for you. So you’ll understand where we say that we don’t want any ... allow you to take one to someone else that’s not here. Just for you. Entirely within the consciousness of this hour. You’ll be surprised how many letters we’ve received from people who have informed us and testified to us of the tremendous help that has come to them from the use of the convent that we made last year. They have used to as a basis of their meditation or had it on a frame that they’ve had before them on their desk that they read occasionally from time to time. We hope that this one will be that kind of a blessing to you. We’ll give you this contract when you leave today. It has a place for you to write your name in. “I, so and so, being of sound mind ...” You write your own name in there at the end. “... and dedication of faith, I make this commitment.” And you sign it with your own signature. And we’ve added our signatures at the bottom, witness and prayerfully supported by Olga Butterworth and Eric Butterworth. I’m going to have you go through this now. So let’s get still and reflect on. I’ll say the words in the first person, as if you’re saying them. Let it become a commitment that you make right now that you can recommit when you read it over on your own. I, Mary Brown, or Jim Jones, or Eric Butterworth, being of sound mind, eager to progress in spiritual growth in the year 1986, do hereby commit myself to a New Era of disciplined practice of truth. As I take inventory of my life, and the many things that should be done by me, I resolve no longer to postpone action and procrastination. Receptively, I listen to the poet as he sings, “Whatever you can do or dream you can, begin it. Boldness has genius, power, and magic in it.” Knowing that there’s no future in the eternal now of infinite mind, I do not pray to be healed. I affirm wholeness now. I do not pray that I will find a job. I affirm that I’m in the right place now. I do not pray that I may become a better person. I affirm that I am now God’s perfect child. Perfect expression. I know it, and I show it. I resolve to renew my commitment every day to the realization, wherever I am, God is. Wherever I may be in time or space, God is with me and within me. And I personalize this principle by knowing, whenever I am, I am. In January or June, in April or December, I am. It is the one sure thing about the year 1986 for me. I am. I affirm I can do what I want to do and be what I want to be, because I know that I am. I resolve to have glorious spaces in each day., like parks in a crowded city, where I can get in tune with myself, with the order and energy of the universe. And I will remember to turn to these spaces whenever I experience tension or fatigue or discouragement. I know that a year is not a thing. And certainly, it will not collect a toll on life and living. That I will be no older in 1986 than in 1985. But I will be wiser and happier. And as I come to the end of the year, I will be able to say, “I have lived.” As I keep the high watch of truth in every day of this year, this New Era of my life, I fully expect and accept an out formation of health in my body, security in my affairs, and love and harmony in all my relationships. And as I reach outward into the world out there, I accept and expect a realization of peace for the whole human family. In dedication and faith I make this commitment. Your signature. Let’s just reflect on this for a moment. Actually see yourself sitting to a desk, writing this with your name in it, personalizing it and signing it. And letting these words sink into your consciousness. Your contract for a Happy New Era. And as you look forward, may you think of your perspective transcending the limitations of days and weeks and months in the year, thinking in terms of the era. An era of growth. An era of health. An era of positive declarations of truth. An era of positive responses to everything that happens to you. This is not to expect perfection, thus to build in the feelings of chagrin and guilt if you fall down. But to condition yourself to love yourself and bless yourself and forgive yourself, but to press on and on and on to the high calling of God within. In this consciousness, you will move forward into the New Era of your life. A New Era of growth. A New Era of the positive declarations of the truth that you know. And we see you carrying this covenant with you in your work, in your relationships with people, and all of your contacts with the world. You’re committed to the conscious expression of the free flow of God activity in all your ways, wherever you are, whatever you do. And it’s good. It’s good. Praise God for the truth that makes us free. So be it.